Many of you might have noticed the recent changes in the Twitter profile page redesign. It looks oddly familiar to Facebook's profile design. But under the hood, there are a lot of changes. Twitter is trying to be more instantaneous. Following up on the recent changes to the profile design, Twitter has announced real-time notifications! The feature will roll out across all accounts gradually over the coming weeks. If there was one thing missing in Twitter, it was notifications. Normally, you'd get notifications via email, mobile apps, and via SMS if you had subscribed for them. Not though, these notifications will come directly on the Twitter website, much like with Facebook where you get notified instantly whenever a story of interest has been made. 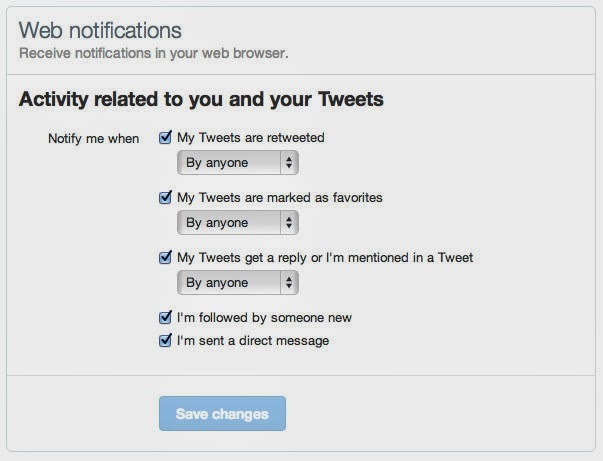 If you are logged into Twitter.com, you will receive notifications whenever someone replies, favorites, or re-tweets one of your Tweets. You will also be alerted for new followers and direct messages . It's all for better user-engagement - the notifications are fully interactive and you can respond right from the notification (i.e. favorite, re-tweet, and reply to a tweet etc). If you are a heavy user, these notifications can also be an annoyance or a distraction. Like all good things, you can go into your account settings and choose which notifications you want to see. As you can see, there are five different types of notifications on view. You also might want to recheck the notifications you get on your mobile app and via email. Real-time Twitter notifications will definitely improve engagement, especially on Twitter.com when kept open in a background browser tab. Do note again, that the feature will be rolled out gradually. If you spot it on your account, tell us what it does for your twitter experience.